Here’s a very small sampling of plants observed in the Masonic Mountain area of the northern Bodie Hills a few weeks ago. After the very dry winter and spring of 2015, it seemed likely there would be very little in bloom this year. But then unusually high rainfall in May and June made a big difference, and there’s a lot to be seen this summer after all. This is one of those posts about a place somewhat “beyond” the Bodie Hills. But there is a connection: when traveling to the Bodie Hills, I often travel across Monitor Pass, on State Route 89 in Alpine County, east of Markleeville. It’s a wonderfully scenic and botanically interesting area — one of my favorite places along the route to Mono County. Earlier this year I started making a map of the Monitor Pass area (during some spare hours at the office) as a way of getting to know the area better. But then the Washington Fire happened. According to InciWeb, the fire incident information system, it was ignited by lightning sometime in early June, but remained small and undetected until June 19, 2015. 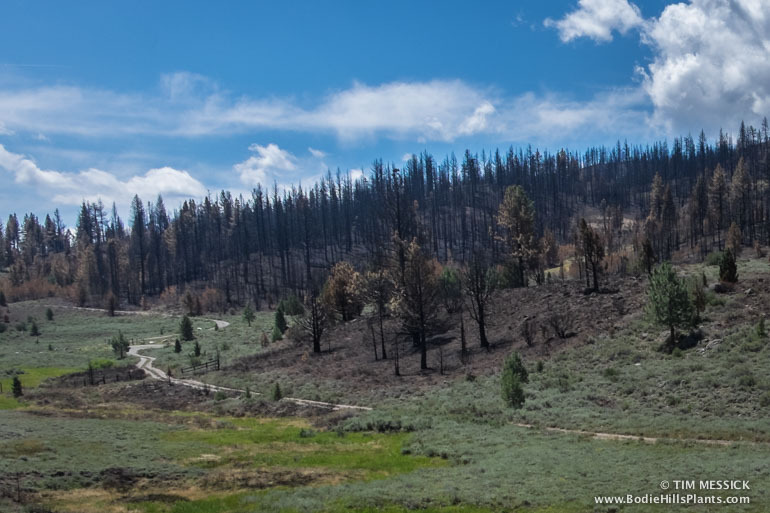 Between then and the first week of July, nearly 17,800 acres of pine forest and sagebrush scrub burned in the East Fork Carson River watershed between Markleeville and Monitor Pass. Nearly 1200 personnel worked hard to bring the fire under control. 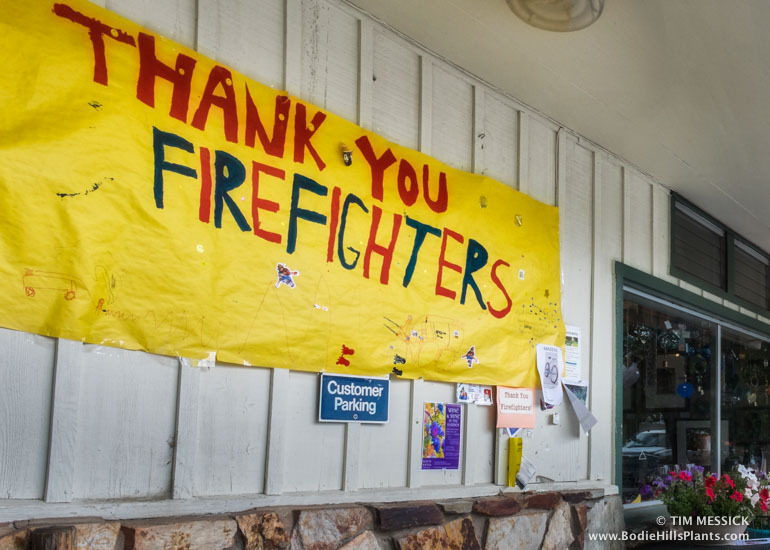 They prevented damage to the small city of Markleeville and many nearby recreational sites. Remarkably, they got the Monitor Pass and Ebbetts Pass roads open and safe to use in time for the annual “Death Ride” on July 11 — a grueling, high-profile, high-altitude cycling event with 5 mountain pass ascents over a course of 129 miles. 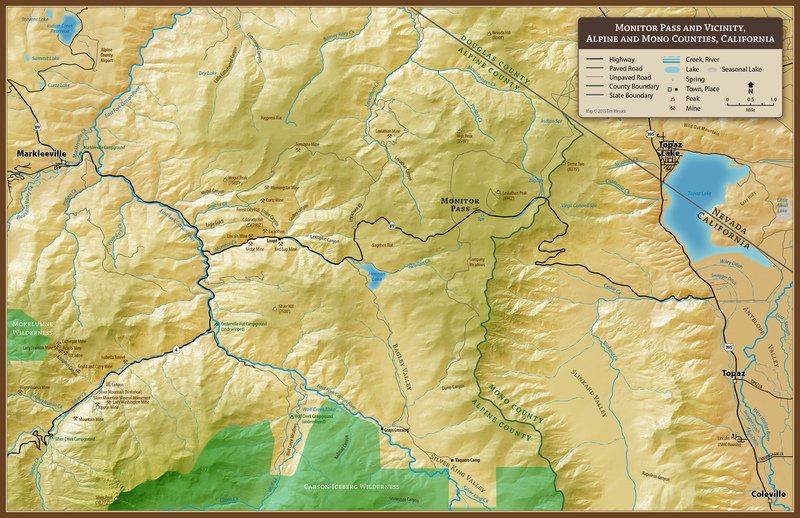 So my map of a favorite driving route turned into a fire history map of the Monitor Pass area. I downloaded the final perimeter of the Washington Fire (a KML file available from InciWeb). Then I found a statewide fire history geodatabase from the California Fire and Resource Assessment Program (FRAP) that maps incidents as far back as 1878, though the earliest fire mapped in the Monitor Pass area is 1941. 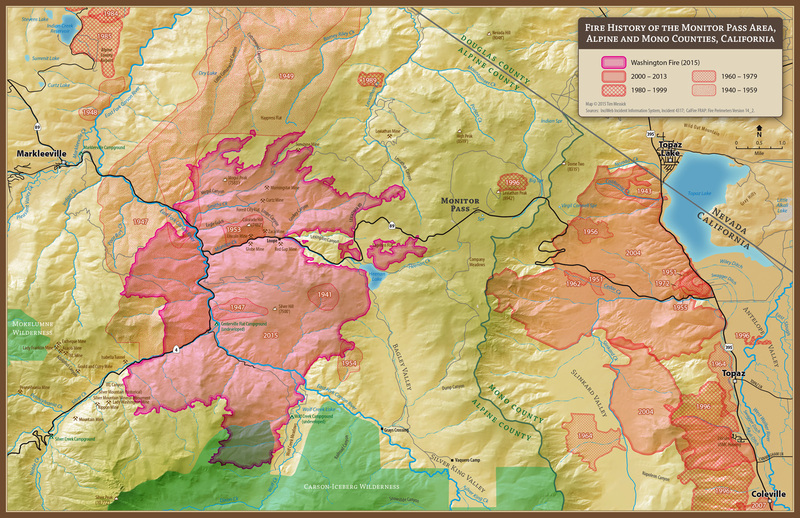 Fires have very long-lasting effects in this region of steep, arid topography. 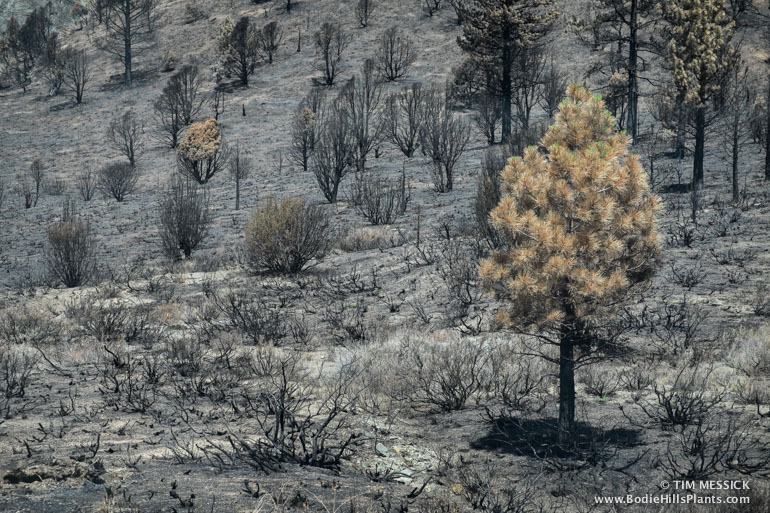 Pines, junipers, sagebrush and other large woody shrubs take many decades to recover even to a fraction of the cover that was present before a large fire. Areas that burned east of Monitor Pass in 2004 still have little woody vegetation. Areas that burned in the ’70s, ’80s, and ’90s are still clearly visible from the air, in Google Earth, or on the ground. Vegetative biomass and the wildlife habitat it provides takes a very long time to recover. The maps were compiled in Adobe Illustrator with the Avenza MAPublisher plug-in from GIS data available on the internet. The shaded relief background was created in Adobe Photoshop with the Avenza Geographic Imager plug-in and digital elevation data available from USGS. Peonies are familiar to most people from their many cultivated varieties and the nearly 40 species that range across Eursia from Spain to Japan. 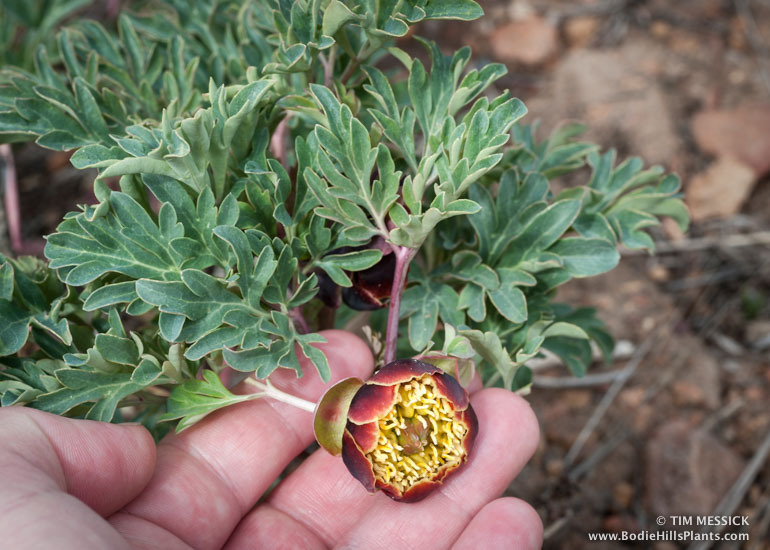 Only two occur in the western hemisphere: Paeonia californica (mostly in the coastal ranges of southern California and northern Baja California) and Paeonia brownii (from the Sierra Nevada, North Coast Ranges, and Cascade Range to Wyoming). Paeonia brownii is fairly common in dry pine forests, sagebrush scrub, and aspen groves in mountains from central California, Nevada, and Utah to Washington and Idaho. In the Bodie Hills I’ve seen it only among aspens in the Lakeview Spring area, but it’s likely to be present in or near some other large aspen groves as well. It’s easy to recognize—nothing else in its range looks like this plant. It’s a low, mound-shaped perennial herb, up to a foot or so tall. The large, slightly fleshy, green to bluish-green leaves are ternately (3 times) divided, with the outermost lobes more-or-less elliptic in shape. The primitive-looking flowers usually hang downward. Their leathery, maroon-colored sepals and petals enclose a dense cluster of yellow stamens. 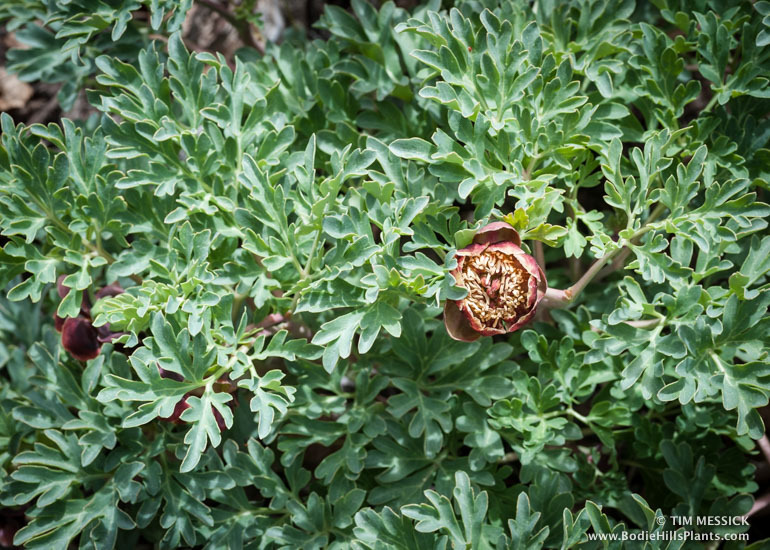 A couple of interesting notes on the ecology of Brown’s peony: The flowers are pollinated mostly by Vespid wasps (e.g., queen hornets), Syrphid flies (flower flies), and Halictid bees (sweat bees) (Bernhardt et al. 2013). The seeds are large enough to be attractive to seed-caching rodents, like chipmunks, deer mice, and pocket mice, but are not as nutritious or as abundant as the seeds of pine trees. This may benefit the peony in that the rodents help disperse the seeds to their caches, but are slow to consume them, so some of the seeds survive to germinate (Barga and Vander Wall 2013). Barga, Sarah C., and Stephen B. Vander Wall. “Dispersal of an herbaceous perennial, Paeonia brownii, by scatter-hoarding rodents.” Écoscience 20.2 (2013): 172-181. Bernhardt, Peter, Retha Meier, and Nan Vance. “Pollination ecology and floral function of Brown’s peony (Paeonia brownii) in the Blue Mountains of northeastern Oregon.” Journal of Pollination Ecology 11 (2013).